So I'm working hard this week on finishing up Pieces of Stronghold. Homeschooled has been completely neglected in the meantime, but I'll be writing the last chapter of that as soon as I manage to finish this darned novella. =D Not really darned, I'm having a good time writing it, but it's much longer than I initially wanted (which means that it's also taking longer to write) and much more involved than I realized it would be. However, it's also a lot of fun slipping into old character's POVs and having a little visit. After writing a chapter for Justin, Chris and Jessica, I'm looking forward to their eventual novella even more than ever. I may write another multiple POV novella after this one or I might not, but it's certainly been an interesting experience. I'm one chapter and the epilogue away from finishing it. WOOT. 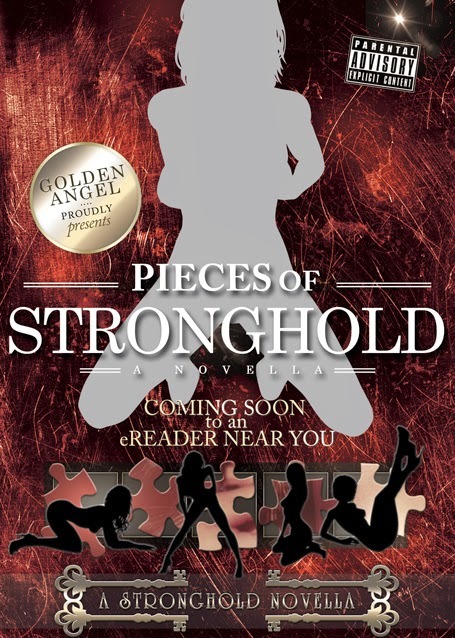 Release date for Pieces of Stronghold will be June 15 and RaineyCloud9 did a gorgeous promo poster for me. Twitter has already gotten the cover reveal =) It'll be up on Facebook this Friday and I'll post it to the blog sometime next week. Facebook gets a lot of the little teaser excerpts from the book, so it only seemed fair that Twitter gets the pictures first. Right now it's looking like the website up next month, which I'm super excited about, as well as finally getting a newsletter going. Yay! Soooo things are moving along. The one downsides is that doing more of this kind of stuff does take away from time I could be spent writing / editing / etc. but I mean hey... that's just how the cookie crumbles. I for one have really missed the victorian DD stuff !!! lol well then I'm glad I'm bringing some back =) I had a lot of fun writing the first quartet and I've got an idea for at least 2 new books! I miss the Victorian DD stuff as well, it inspired me to (finally) get a flogger to play with. It's amazing how difficult it is to find an inexpensive and well made one with real leather (yay ebay and Mr Thuddy!). I've been checking your blog daily for updates about Pieces, it'll be an awesome early birthday present. I enjoyed Milking Meggie more than I thought I would, so I'm hesitantly looking forward to Hebe as well. Not my kink at all, but with you writing it.. it's absolutely worth looking at. Happy early birthday! (super early if June 15 is going to be early to you lol). Pieces will only be 99 cents, so it's a nice and cheap present to give to yourself! I'm glad you enjoyed Milking Meggie! I hope you end up enjoying Hebe as well =) One of my goals with the kink books is writing them so that everyone can enjoy them, even if it's not their kink =) glad to know that it seems to be working!